Dwight Hicks was born April 5, 1956 in Mount Holly and grew up in Pennsauken Township, across the river from Philadelphia. A multitalented athlete who enjoyed physical contact, he was drawn to football. At Pennsauken, Dwight played for coach Vince McAneney and helped the Indians attain a #2 state ranking in 1972. The team went 26–9–1 during Dwight’s four varsity seasons. Recruited by several schools as a defensive back, he chose the University of Michigan in 1974. Dwight was All-Big 10 in 1976 as a junior and All-Big 10 and an All-American as a senior in 1977. He intercepted 5 passes during his varsity career. In the 1978 NFL Draft, the Detroit Lions selected Dwight with their 6th-round pick. Dwight chose not to sign with the Lions and played instead for the CFL Toronto Argonauts. After a 4–12 season he returned to Detroit and was working in a health food store when John McVay of the San Francisco 49ers tracked him down and told him he wanted him as part of the team’s rebuilding secondary. Coach Bill Walsh was looking for good athletes from great programs to grow together as a pass-defense unit, and Dwight was a perfect fit. Of the 30-plus defensive back brought into camp during the summer of 1979, Dwight was the only one the team signed. NFL quarterbacks went right after Dwight and he proved to be up to the challenge. He picked off 5 passes in 8 games as a rook in 1979 and 4 more in 1980, when he became the team’s starting free safety. The following year, Walsh drafted Ronnie Lott, Eric Wright and Carlton Williamson and teamed them with Dwight in the secondary. Dwight Hicks and the Hot Licks were born, and they led the team—along with Joe Montana—to a 13–3 record. Dwight was third in the league with 9 interceptions and led the NFL with 239 yards on interception returns. In the playoffs, San Francisco defeated the Giants and eked out a win over the Cowboys in the championship game on the famous Montana-to-Clark touchdown pass. 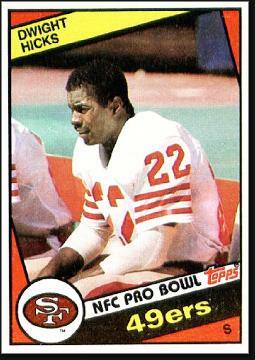 In Super Bowl XVI against the Bengals, Dwight killed the first drive of the game deep in 49ers territory when he picked off a pass intended for Isaac Curtis and returned it 27 yards to the 32 yard line. Montana engineered an 11-play touchdown drive to give his team a 7–0 lead. The 49ers went on to win 26–21. Dwight made the Pro Bowl after the 1981 and in the three seasons that followed. Opponents got little smarter about throwing his way, but he still intercepted 8 passes during that time, including 2 in 1983—both of which he returned for scores. The 1984 team went 15–1 and won Super Bowl XIX against the Dolphins. Dwight was the defensive captain of the championship team. He and his three backfield mates all went to the Pro Bowl that winter—only the second time in history that had happened. In 1985, Dwight split his time between the safety and cornerback positions, and recorded the first and only quarterback sack of his career. Heading into the 1986 season, Dwight became embroiled in a contract dispute with the team. He also admitted having using cocaine during his Pro Bowl years. The 49ers decided it was time to part ways and released Dwight during training camp. He signed with the Indianapolis Colts after the season started and played in 9 games. He intercepted 2 passes, giving him 34 for his career. The 1986 campaign proved to be his last. 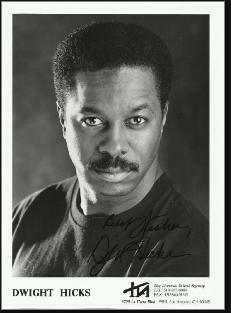 Dwight had caught the eye of the director during a PSA filmed at the 1985 Pro Bowl and was encouraged to try his hand at acting. Dwight landed his first movie role in the Nick Cage–Sean Connery action film The Rock and kept rolling from there. He also hosted a 49ers wrap-up show on KTVU in San Francisco. He also narrated The Faithful, a documentary series by 49ers Studios that explores the lives of the team’s top players. In recent years, Dwight lent his voice to the NFL’s concussion controversy, advocating for better equipment and working with designers to build a better helmet.